Ansel Elgort is wonderful in the leading role. Wright dispenses with lengthy exposition and character development because he can certainly afford to, but Elgort manages to convincingly sell his character’s plight and get us to care about the journey. Seasoned pros like Kevin Spacey and Jon Hamm are brilliant in their roles, the dialogue smoothly rolling off of their tongues as they deliver performances full of menace and humor in equal measures. Thankfully, Hamm gets a sizable role, and everyone who hasn’t had Mad Men in his or her life gets to see just how great this beautiful man is. Edgar Wright understands his dialogue and his actors and his style, and he is undoubtedly an incredible director in his prime (he also sure knows how to shoot an action scene). He’s in the midst of a hell of a stride right now, the likes of which I’ve seen from filmmakers like Quentin Tarantino. This is his passion project, his expression of love for the history of music and film. It’s a beautiful blend of style and substance. It’s big, confident, and kinetic filmmaking from someone who clearly respects the craft and knows exactly what he wants to accomplish. It’s a film about life, love, and hitting the road with some great music, and it’s truly something special. 2017 film has a new high bar to clear. Now this is a film that I have no desire to see. When I saw the trailer it made me think of the Ryan Gosling film, Drive the early years and the Vin Diesel Wacky Racers franchise. Of course it will be popular, it has white boy heroes, guns, gangsters,fast cars and babes, now set to tunes. I have had my surfeit of films like this,so no thanks. And I always knew Jon Hamm was more than Don Drapper, he is very funny and has great comedic timing, as seen in 30 Rock and The Unbreakable Kimmy Schmidt! Fair enough. But yes Jon Hamm is amazing. Exhilarating is a great word. 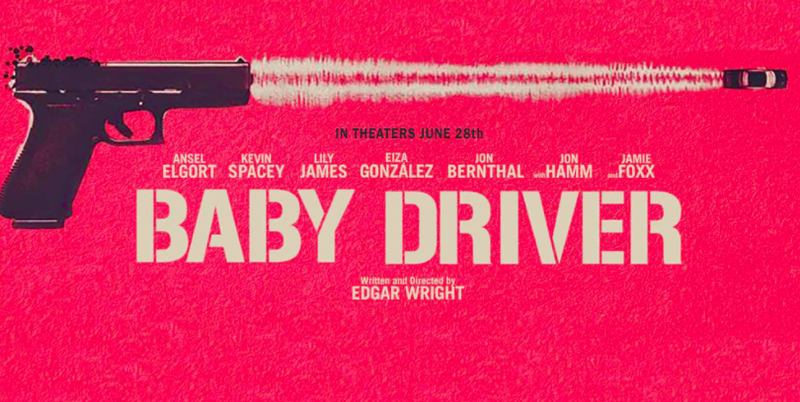 I like Edgar Wright a lot but am not big on car chases so wasn’t sure what to expect. In fact, I loved the pants off this. I thought it was fun every single moment. Very well done, marries the action and music wonderfully. Can’t wait to see it again! This movie was fun, fun, fun! I enjoyed it so much, I was smiling through the whole film.